Illustration © The Estate of John David Roberts. Reproduced with the permission of the William Roberts Society. Text © David Cleall, from the October 2014 William Roberts Society Newsletter. After 18 months of active service in northern France, in April 1918 No.123744 Gunner William Roberts of the Royal Field Artillery returned to London with a commission via Paul Konody, the art adviser to the Canadian War Memorials Fund (CWMF), for a large-scale work on the subject of the first German gas attack at Ypres, three years earlier. Although, as he noted, he was 'without experience of that kind of cloud gas warfare, and told Konody so',  based at a studio in Chelsea in the summer of 1918 Roberts clearly worked on the project with an intensity that must have been fuelled by his own war experiences. 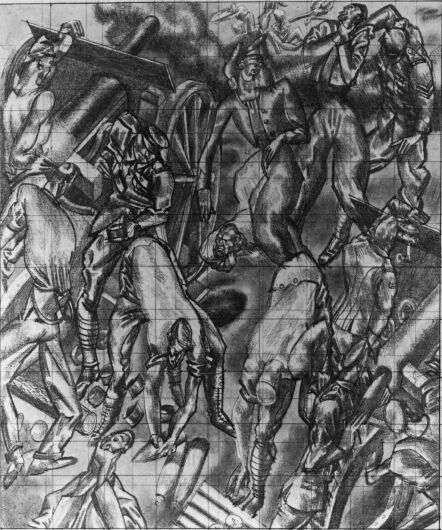 Roberts, along with David Bomberg  and presumably the other avant-garde artists commissioned: Wyndham Lewis, Edward Wadsworth and C. R. W. Nevinson  was warned that only 'representative' work would be acceptable, and indeed Bomberg's first version of his Sappers at Work was rejected by the CWMF as being 'too cubist'. Nevertheless, Roberts's The First German Gas Attack at Ypres is a huge, uncompromisingly modernist picture. Its size (10 feet x 12 feet) was dictated by the commission  40 of the CWMF commissions were intended as monumental works. In her book Art at the Service of War: Canada, Art, and the Great War, Maria Tippett suggests that the success of Roberts's painting lies in his decision to focus on the specific moment in the Battle of Gravenstafel Ridge when chlorine gas forced the mainly Turco and Zouave soldiers in the French front-line units to retreat from their position through the Canadian support trench: 'the twisted faces and writhing bodies of the 45th Algerian Division meet the surprised soldiers of the First Canadian Brigade . . . Like no other painting in the CWMF collection, The First German Gas Attack at Ypres conveys the confusion and the horror of modern war.' Aside from its size, what strikes one immediately about the canvas is the brilliance of the colour, with unsettling clashes of reds, pinks, yellow and lime green reminiscent of Roberts's 'Vorticist' Theatre and Two-step of 1915. While the colours of the Turco and Zouave uniforms are historically accurate, they provide a startling contrast to the necessary muddy khakis of most war art. And Roberts adopts a characteristic 'impossible' high-angle point of view, creating a claustrophobic picture space packed with disturbing details and bold expressionistic elements. Following exhibitions of the CWMF paintings in London, New York, Toronto and Montreal in 1919, there were very few opportunities to view The First German Gas Attack, especially since Lord Beaverbrook's plan to display the CWMF collection in a purpose-built exhibition space in Ottawa collapsed in the early 1920s. The whole collection of nearly 1,000 works by 100 artists (a third of whom were Canadian) was given to the National Gallery of Canada. A number of the 'super-paintings'  including Roberts's  were shown in New York's Museum of Modern Art in 1941 in 'Britain at War'  an exhibition presumably intended to contribute to the debate about America's then neutrality in the European war. In 1965 Ronald Alley arranged for Roberts's painting to be brought back to London for the Arts Council's Roberts retrospective at the Tate Gallery, but, aside from these rare outings, the canvas generally remained in store, rolled on to a drum, and became in need of considerable restoration work. When, in 1988, the National Gallery of Canada moved into a striking new building opposite the Canadian Parliament in Ottawa it had an opportunity to display a group of the super-paintings from its CWMF collection, and a large hall had been identified for this purpose. But initially the hall was used for a temporary exhibition of post-war American art centring on the loan of an enormous abstract painting, Barnett Newman's Voice of Fire, and when in 1989 that picture was controversially bought by the gallery, for $1.8 million, it remained in place there with other large abstracts. Currently Lewis's A Canadian Gun-pit, Bomberg's Sappers at Work: A Canadian Tunnelling Company and Paul Nash's Void are exhibited at the gallery in a 'modern British' room, while Wadsworth's Dazzle-ships in Drydock at Liverpool is dramatically displayed nearby. Back in 1919 The Times's art critic, reviewing the CWMF exhibition at the Royal Academy, commented that 'It is a pleasant, but perhaps unprofitable, speculation, what the future generations of Canadians who will look on these pictures [the CWMF paintings] will make of the allegories . . . Apart from any artistic importance it may possess, they will not learn very much of "The First German Gas Attack at Ypres" from Mr. W. Roberts's picture.' However, almost 100 years later, Roberts's painting is being used exactly for that educational purpose  with no photographic record of the gas attack at Ypres, Roberts's work has value as an informed depiction. 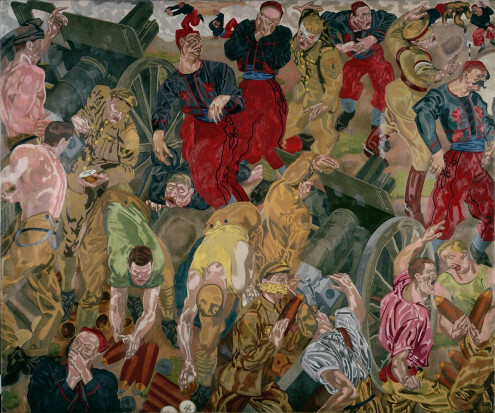 And, perhaps even more significantly, the painting's powerful expressive quality is being used to ask visitors to consider the chaos and question the horrors of warfare. I can't help thinking that Roberts might have preferred to have his painting hung alongside Bomberg, Wadsworth and Lewis in the National Gallery of Canada  but, with average annual visitor numbers of almost half a million to the Canadian War Museum, The First German Gas Attack at Ypres may have now become Roberts's most often seen work. William Roberts, 4.5 Howitzer Gunner Royal Field Artillery 1916-1918: Memories of the War to End War 1914-1918 (London, 1974), p. 32. Maria Tippett, Art at the Service of War: Canada, Art, and the Great War (Toronto: University of Toronto Press, 1984), p. 70. War Story in Pictures: Canadian Exhibition at the Royal Academy', The Times, 4 January 1919.